We’ve almost made it through another international break. Premier League football starts back up this weekend. Arsenal play Watford on Saturday at 12:30 ET. In contrast with the last international break, I’ve survived with a minimum of depressive introspection. Maybe avoiding introspection is the key to survival. I’ve kept busy at work on some projects and travel and during the weekends with kids’ activities. While I haven’t been introspective, I’ve spent a ridiculous and, frankly, embarrassing amount of time since the last game on October 4th reading match reports and watching video of Arsenal’s match against Manchester United. I’ve watched so much, I think I could now back heel the ball into the goal just like Alexis did. But I would do a classic No Celebration afterward, not like the kind when you’re playing against your former team, but the kind where you’re just so bored from doing something so darned brilliant all the time. You want to be as blasé as moi? Watch the video. Again and again. You really can’t watch it too much. Actually, you can watch it too much, and I almost certainly have. We’re now eight games into the Premier League season, not quite a fourth of the way. It’s an interesting season because no club seems to be in the mood to run away with it yet. No team is undefeated. Manchester City started strongly, but had a rough patch in the middle. They went back to the top on Saturday with a rout of Newcastle, but they lead the league by only two easily surmountable points. 10 teams are within two wins of the leaders. As the season continues we can expect to see a few teams pull away, but which teams they will be is anyone’s guess. The teams that have surprised in a positive way are Crystal Palace and Leicester City in 4th and 5th place, respectively, but only three points off the league leaders. None of the three newly-promoted teams–Watford, Norwich, or Bournemouth–sit in the relegation zone, places 18 – 20. That honor goes to Aston Villa, Sunderland, and Newcastle. Neither Newcastle nor Sunderland have won a single game. 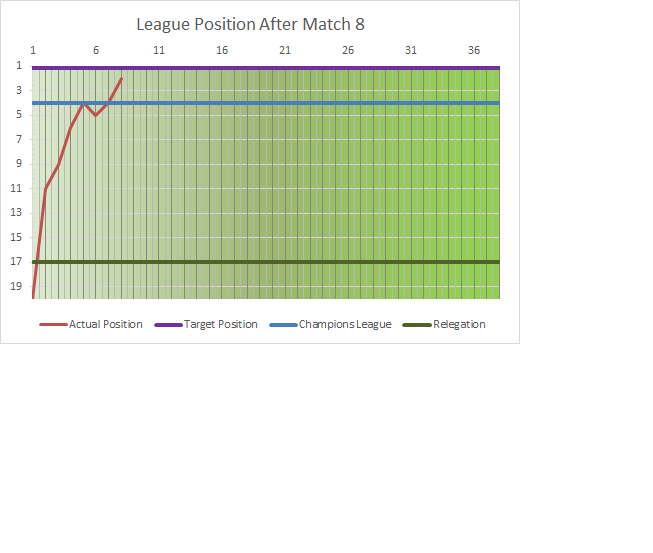 Arsenal have put in a respectable showing, working their way slowly up the table to second position. As you may recall, the goal is very simple: Win the league. Or, more specifically, win it for meeeeeeee. It would be awesome if they could do it very clinically and decisively. We pause to note that is not the way Arsenal do things. No, if I am supremely lucky and get my wish, I almost certainly will be required to sweat it out until the 11th hour + 94 minutes. 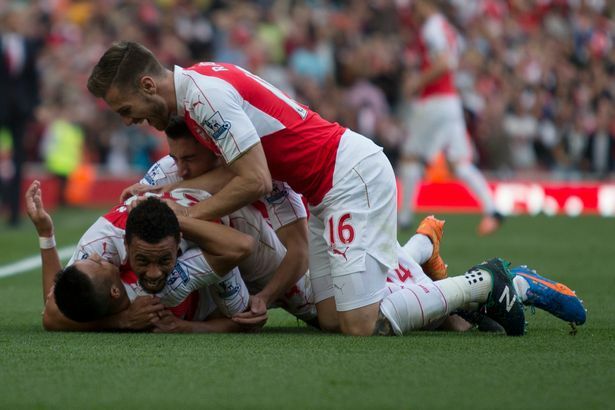 Five out of the eight teams Arsenal have played so far this season are currently in the top half of the League. Four of them are in the top six. Much can change given the tight band in which the top teams are collected, but it should be a positive that most of the matches for the rest of this half of the season involve teams with a relatively weaker showing. The biggest threat is complacency. If the Arsenal players have wallowed in the Manchester United victory the way I have, we are doomed for sure. The second biggest threat is injuries. We know that Chile’s manager played Alexis Sanchez injured for 90 minutes against Brazil, and it’s believed he’ll do it again today against Peru. That is unlikely to bode well for Arsenal. In the Champions League, Arsenal have had a completely dismal start, sitting in last place in their four-team group having only played the easiest competition in the group. What would probably be worst than finishing fourth is finishing third and having to compete in the Europa League. That is admittedly a terrible way to think about it, but all those extra games will almost certainly impede progress in the Premier League as players must be rotated to keep fresh. The extra games also bring the threat of injuries as the season wears on. Arsenal are still in the Capital One Cup, and have yet to start in the FA Cup. So overall a mixed bag, but with some bright spots to be sure. We have a few games to attend live before the end of the first half of the season. I’m happy to report that the morning after my whining post about American Airlines, my husband spotted a great deal on flights for the December game on Kayak. A supposed Finnair flight, one leg of which is actually run by American–exactly the same flight I wrote about in my post. Crazy industry, but we are completely dependent. At this moment, not unhappily dependent. Now if they break with tradition this year we really are in with a chance. No November slump allowed this year!